This weekend marks the second to last weekend I'll be in London. I know, I know that is sad, but hear me out. I figure at this point I have seen ALMOST everything I want to see and done almost all I want to do in London, BUT on second thought I have not. I live in on Leinster Gardens in Bayswater, close to Paddington in the central belly of what is London. I enjoy a fine urban living atmosphere, much different than that of my living condition in Richmond and even Muncie. I rely on public transportation, be it the London Underground or the Bus service that is run by the same London Transport Authority. My most used individual areas of transportation are the Bayswater, Queensway, and Paddington Underground station as well as the no. 94 bus that picks me up and drops me off on Bayswater, right in front of Leinster Terrace (which become Leinster Gardens). Just tonight I made my way via Paddington Station and the Bakerloo line to Charring Cross to meet a couple of my aunts friends, who I consider my friends at this point, for a pizza and talk prior to a concert they were attending. After a brief talk over dinner I made my way to Parson's green, on the District Line to find a restaurant entitled "The Fest." This restaurant utilizes women, as waitresses, dressed in German outfits while showing sporting events on televisions scattered throughout the bar. However, as I made my way down there (10 stops from Charring Cross) I soon realized that in this residential area, and more importantly the restaurant was not going to be inviting to me tonight. Approaching the outside of "The Fest" I read a sign on the door which said "Private Party." (You know what that means as I do) So I left and headed back the way I came toward Parsons Green Tube Stop. After arriving at Parsons Green, the actual Green and/or Park space I found a bar on the corner that intrigued me and as i had nothing else to do and no where in particular to go, I thought why not try out the local Hammersmith and Fullham atmosphere in the form of a pint, or two, or three. I walked into the bar, entitled the "Swan" and ordered a pint of a real ale I had not had before, which I have been doing since I arrived in London. It was called Harvey's Sussex Best Bitter and it was rather good. A bit fruity in the beginning but definitely bitter at the end, as I like it. I stood next to the bar and drank down as I took in the atmosphere. After almost gulping down the first one I belly back up to the bar and ask the barmaid for a "Freeminer Speculation." This is yet another I have not heard of. The first sip sends me on a ride of non-content. I enjoy the beer but it is not, by far, my favorite, especially in the Ale genre. I drink it slowly and enjoy it for what it is, all the while taking in more of the atmosphere; the couples, the groups, the older man spilling his beer onto the floor as he stands at the bar and the families. Hmmm, yes, the families. Until now i have not really thought about it like this but the fact is people in Britain take their families to pubs, which often times are restaurants, but more importantly pubs. While choking down the pint of Ale, I watched as a lad of probably around 6 grasped the bar and balanced himself along the brass foot bar that ran the length of the bar. I watched as his father asked him what he wanted to drink. And then I watched as his father allowed him to try the Stella Artois he had just bought for himself, which the youngster gave an uninspired face in response to. I guess when I first arrived I took in all that was different and this was one thing that was. Families in bars. I thought it strange because in the U.S. it is almost a crime, punishable by jury to bring a kid not barely kindergarten age into a place where grown men come to drink their problems away. However, as I pondered over the fact that I have become accustomed to this in the UK, I also was quick to distinguish between the classy establishments (The Swan) against the not so classy (Ye Old Cheshire Cheese). I began to think, as I was on my third pint and final for the stop, that although families come to eat in these establishments, I have not once seen someone bring their young kids into places that are considered nothing more than boozers and might as well throw the menu out. I figure that in the UK, they are comfortable with their drinking enough that distinguishing between the family restaurant, which is often a pub, and a boozer, like some I've been to, is not that hard. Anyhow, I left there after three pints and headed toward Parson's Green, taking the Tube toward Westminster and then changing at Charring Cross heading North on the Northern Line toward Leicester Square. After running into a couple arguing and clogging the escalator, I made my way out and then wandered to the nearest pub. The pub, also clogged with people, served as merely a urinal prior to my quick departure toward China Town. 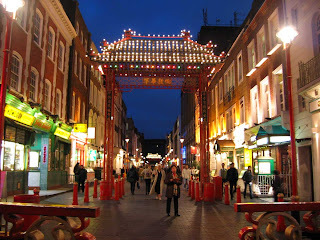 After arriving in the Red area of London I found a restaurant that seemed to suit my fancy, serving King Prawn Fried Rice and Won Ton Soup. I pushed my way into the Fried Duck and ordered prior to hearing the waiter argue with the group next to me. I also ordered tea, by the way, which was 0.50 and was unlimited, make a note. The meal was excellent and filled my tummy to the brim. After paying the 10.50 i owed I left and headed down Shaftsbury Ave. toward Oxford Street, before hopping on the no. 94 bus back to Leinster Terrace.